Send voice messages and reminders to thousands or millions of contacts at high speed. Answering Machine Detection with leave-a-message-after-the-tone identification. Build interactive voice apps using recordings or use TTS for a more personal touch. Live lead generation allowing a contact press 1 to transfer the call to an agent. Use text Broadcasts to send marketing messages, alerts, promotions and updates. Internal and external DNC (Do Not Call) lists supported. Press one campaigns used for lead generation where you call your prospect, explain your proposition and invite them to press 1 to speak to an agent are a very effective and low cost marketing and sales tool. 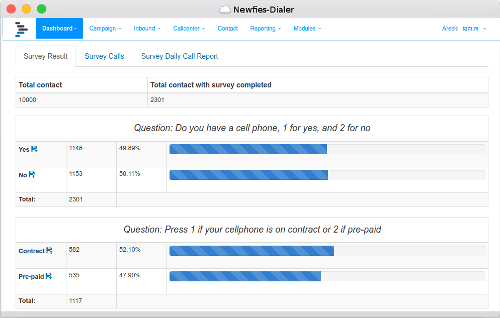 Ring thousands or millions of people per day, poll their opinions, carry out a market research survey or take their vote via a key press in response to an IVR and record the results. Broadcasting marketing or information messages to existing customers as well as sending messages to leads and prospects to raise awareness of your product or service. Messages can be pre-recorded or customised with text to speech. Chase debt automatically by phone, retry debtors that don’t answer on multiple phone numbers. Invite them to press 1 to speak to the finance department. Debtors that do not respond to you messages can be called again until they do respond. Call leads and prospects with your proposition in a pre-recorded message and invite them to press 1 to transfer the call to your sales team so that they can make the sale. Designed for telecoms and SAAS companies to sell voice broadcasting services to their customers under their own brand. Multi-tenant systems allow many customers to share the same system while being billed for their calls. Call contacts and identify whether the call has been answered by a machine or a person. If a person answers, immediately bridge the call to a waiting agent. Alternatively if a machine answers, leave a message after the beep. Choose your own VoIP carriers in your own country for the best possible prices. 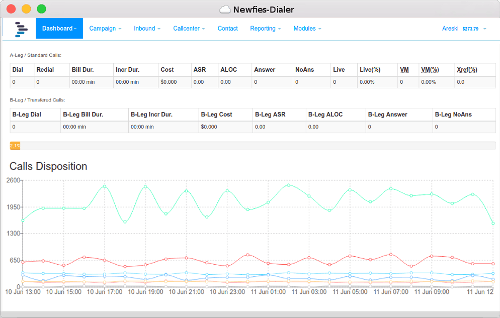 If you are making large numbers of calls, then Newfies-Dialer usually represents better value for money on the basis of reduced call costs. 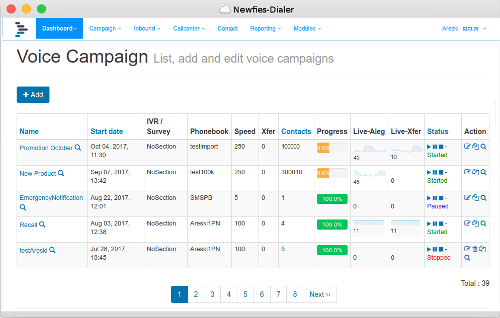 Our voice broadcast system, Newfies-Dialer, has been trusted by hundreds of companies to deliver Voice broadcast services. We are one of the best multi-tenant platforms for any organization wanting either to use or provide voice broadcast services.